This November sees the launch of Sanders, a new boutique hotel concept based in Copenhagen. Created by founder Alexander Kølpin, a former professional ballet dancer, the property will provide a carefully curated and luxurious home, welcoming creative mavens from around the globe. Based in the historic and cultural centre of Copenhagen, nestled behind the Royal Danish Theatre, Sanders is found in an iconic Jugendstil building, dating back to the 1860s. 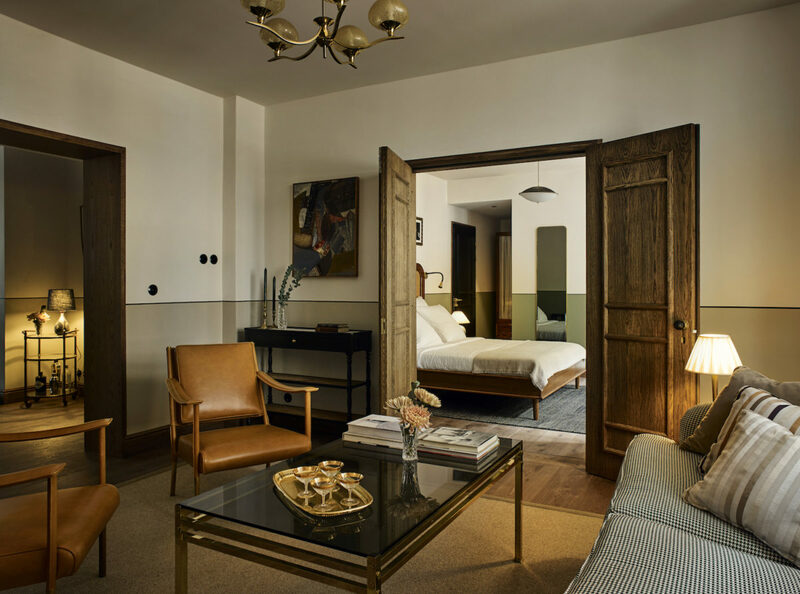 Comprising 54 bedrooms, each room has been put together with bespoke furniture and richly textured decor created by London-based design duo, Lind + Almond, in collaboration with signature family touches from Alexander and his father who together form Kølpin Hotels. Sanders fuses Eastern influences with classic Danish design and European eccentricities to create immersive spaces, where glistening vintage Murano glass, meets oriental rattan ceilings and finely designed woodwork touches on bespoke contemporary tiling. “For the bedrooms, as you know with most interiors, we don’t focus on one material to create some kind of feature. It’s an ensemble of objects, furniture and pieces that all create the interior space. The material palette of the rooms is very natural. We’ve got quite a lot of timber, both on the floors as well as the furniture. With natural wood you also want to work with natural stones so we’ve got marble floors in the bathrooms and then that leads to metals; we’ve chosen to mix both brass and nickel, which will tarnish beautifully in time,” Lind explains. A selection of works by emerging, international artists have been commissioned by London arts consultancy Dais Contemporary, who have curated pieces throughout the hotel. The consultancy, led by Lydia Cowpertwait, collaborates with a broad range of artists and galleries, including Arcadia Missa, Maureen Paley and Victoria Miro in London. Prior to founding Dais, Cowpertwait ran Hoxton Art Gallery, a contemporary art venue based in east London that promoted emerging artists; she also worked for leading institutions including the Whitechapel Gallery. For Sanders, Dais commissioned works from a number of artists, including Lily Ludlow, Mat Chivers, Kirsty Buchanan and Elke Sada, among others. For the hotel, Chivers produced a set of prints, which explore human perception, nature and the human body. The works feature delicate images of botanical specimens, as well as figurative forms and hang in the bedrooms of the property. Buchanan produced a new series of life drawings, featuring individually hand painted figures that were drawn in sepia ink. The artist titled the series Somnolent Nudes, referring to the dreamlike state that each of the figures are in. Sada is a German multidisciplinary artist based in Leipzig, who trained as a research scientist for over ten years before attending the Royal College of Art in London to study Fine Art and Ceramics. For Sanders, Sada created a collection of drawings for the bedrooms. Each drawing is expressionist in style with the artist utilising a range of brushes with black ink. The ‘movement’ in each work is inspired by the intonations in classical pieces of music. 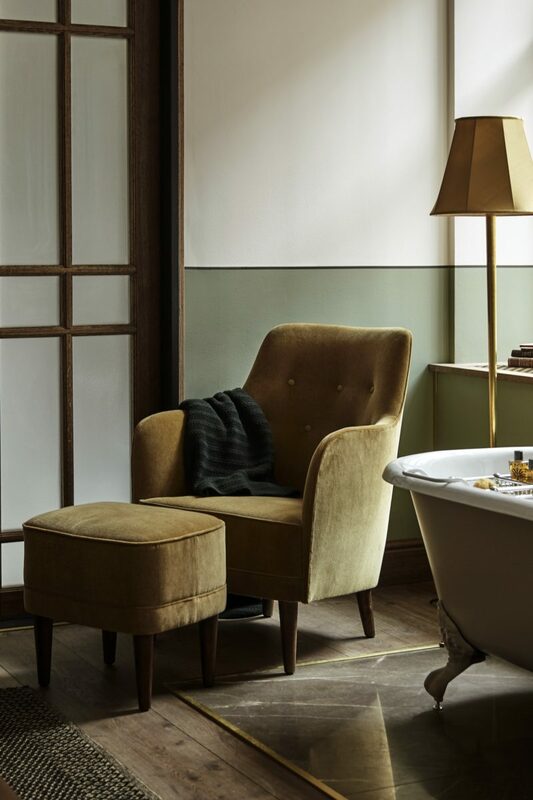 This makes a subtle reference to the heritage of Hotel Sanders, being close to the Royal Danish Theatre and being the original theatre hotel in Copenhagen.